A warm, woodsy kitchen is always appealing to me. Perhaps, this is because it reminds me of old bakeries or even old cottage houses filled with that whimsical smell of fresh bread being baked in the oven. So it's like synesthesia- love the smell, love the look. 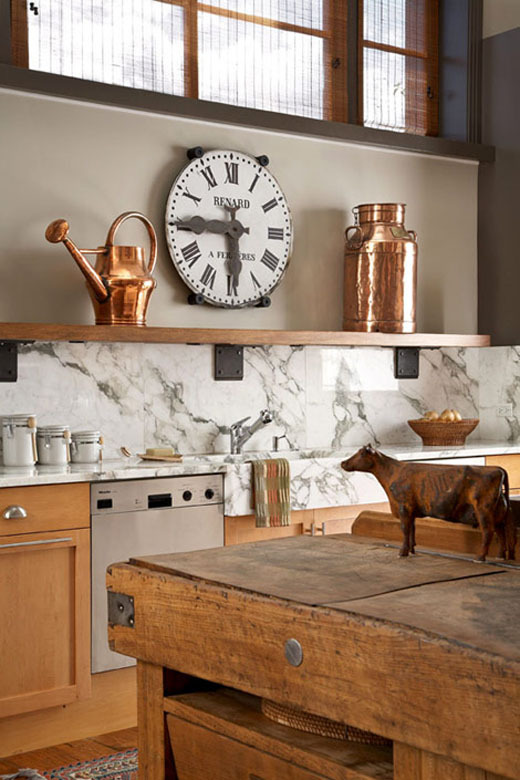 Whatever the reason, I had no difficulty summoning up a few images of inspiring kitchens. 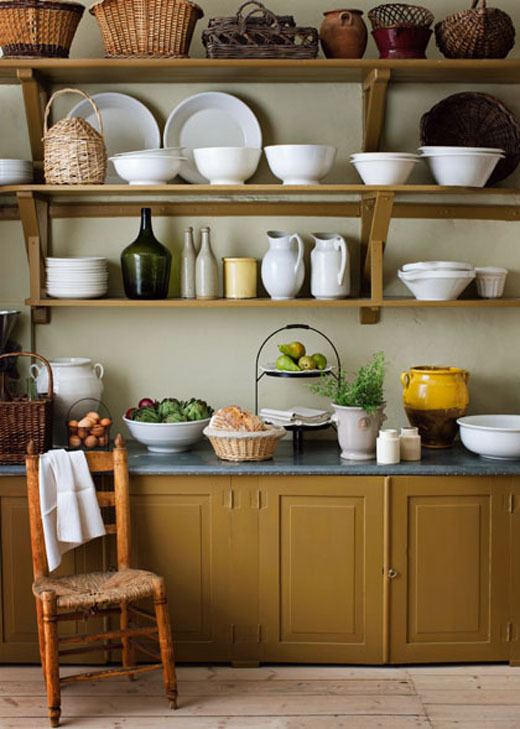 What do you think of these country style open shelving with the white dinnerware and the rattan basket all neatly displayed? 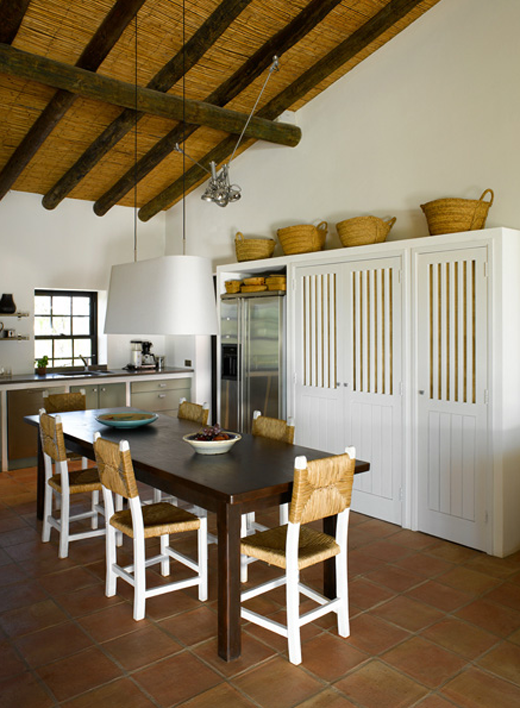 Or the rattan lot right beneath, covering baskets and chairs, complementing the bare straw roof? 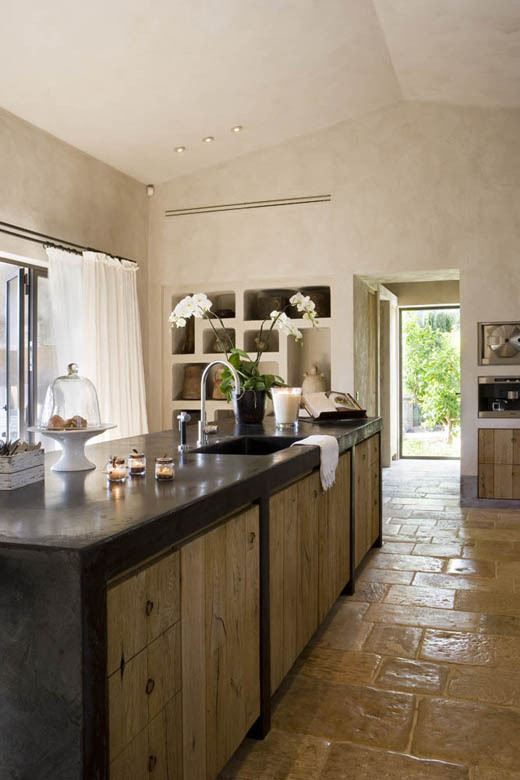 And the stone/concrete built in elements contrasting with the raw wood cabinets for a more sleek result (isn't that black concrete island amazing?) and that impressive marble countertop and splashback in the last photo. 4 comments on "Honey kitchen love"
Kitchen #2 is my favorite - with its high ceilings and clean lines - love it! And yes, all the items in the shelves in that top photo are welcome in my kitchen. I love them all. My kitchen is not as...warm in feeling as those, but I'm certainly drawn to them. Oh to have ten kitchens! We have concrete counters and I love them. Love my stainless island too though! Αχ μου θυμιζουν τοσο πολυ χωριο. γιατι συνδυαζει παραδοση και μοντερνια.